With innumerable miles, gigs and festivals under his belt, the man known affectionately as "Magpie" is finally releasing his debut collection. Welcome to Sanctuary. Alluding to an era of more simplistic notions, Magpie Diaries take flight into an abundant musical sanctuary with this 11-track debut album. 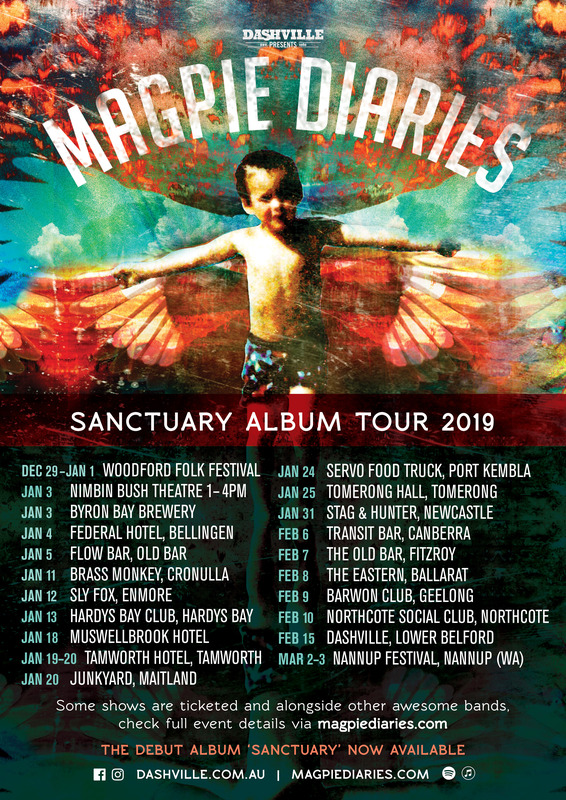 It's a sanctuary that delivers Magpie’s story via smooth soulful country, with subtle flourishes of psychedelic rock and roll attributed to great acts such as Grateful Dead, Neil Young and Van Morrison. These influence of these luminaries is melded with modern influences such as Cat Power and My Morning Jacket. Sanctuary is a journey through the past and into the future, where one can still roam with wild exuberance. Where the desire to perform is matched with the desire to escape and unravel inside the music.